What better way to get into the festive spirit than sticking on a classic Christmas movie, cosying up on the sofa and sipping on your favourite hot beverage? That’s a rhetorical question because there isn’t one. That’s why our contributors have shared some of their favourite festive films that can keep you company on your cosy Christmas nights. If you are looking for a touching Christmas comedy with great humour then ‘Elf’ is the one just for you. It’s that kind of movie in which so many different emotions intermingle to create a story worth giving a go. From joyful Christmas cheer to sadness, curiosity and a sprinkle of love, “Elf” really is one of the all-time-classic Christmas movies. After Buddy (Will Ferrell) accidentally becomes a North Pole elf his life goes through many twists and turns in the quest of finding his true self. Raised by his Papa Elf (Bob Newhart), he knows he is at least four feet taller than most of the other elves and believes in the fact that he is just ‘special’. Finding out the truth makes the human-elf embark on his greatest journey in the big city of New York searching for the person he loves most – his birth father. With his big heart, Buddy not only spreads the Christmas spirit and happiness, but he also finds a new family who love him unconditionally and the woman of his life. It’s getting colder outside and Christmas is already knocking on the door, so grab a cup of hot chocolate, wrap yourself up in a warm blanket and steal some time to mark the beginning of the festive season with a nice film. 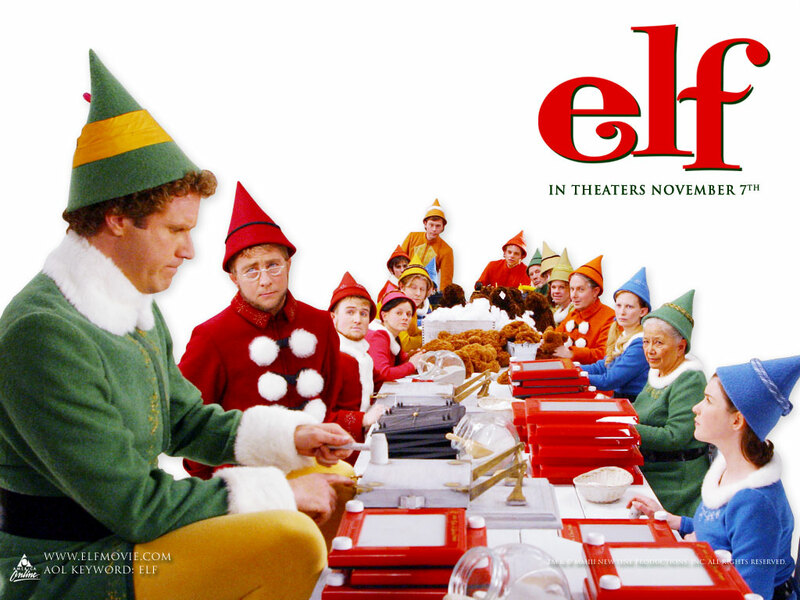 ‘Elf’ will do the rest for you- 100% festive mood is guaranteed. This is a film that me and my mum watch year in year out every Christmas cosied up on the sofa with a few too many chocolates. If you love ‘Love Actually’, you’ll struggle not to love this. The Holiday is a feel-good, mushy, sickly sweet rom-com where you can live vicariously through the two women; Amanda (Cameron Diaz) and Iris (Kate Winslet). The two women exchange houses after they have had enough of their love lives. Swapping cars, houses, everything; both on opposing sides of the world in completely different lives. Iris’ traditional, quaint, cosy cottage on the outskirts of an English village and Amanda’s LA tech-savvy modern mansion; their lives couldn’t be more different. A lot can and does happen in the two women’s short Christmas holiday exchange. Sure, it’s slightly ridiculous but aren’t all Christmas films? Jude Law and Jack Black play the leading lady’s love interests and I will be genuinely shocked if you haven’t fallen madly in love with Jude Law’s character by the end of the film. The late Eli Wallach’s performance in this film is absolutely heart-warming and gives a side-plot to the film that rounds off the film nicely. With a running time of 2 and a half hours, you’ve got to really dedicate yourself to watching but it’s great to escape real life by immersing yourself into this rom-com. Perhaps one of the unsung heroes of Christmas movies ‘Christmas with the Kranks’ has been a long-time favourite in my family. I’ve seen it slated by critics but an easy to watch Christmas comedy is exactly what the doctor ordered in my books. If you’re looking for a light-hearted and satirical film to get you in the holiday spirit, this one delivers every time. A classic plot with the main characters shunning the Christmas spirit but ultimately giving into the festivities. It is perhaps Jamie Lee Curtis and Tim Allen in the lead roles which really sets this apart from the rest. The story follows a couple who have decided to skip Christmas and go on a cruise which is much to the distaste of their neighbours who take Christmas to a new level of intense. As Christmas day approaches they revel in the amount of money they are saving until they hear that their daughter is coming home for Christmas. Their mad rush to get everything prepared at the last minute is comical and heart warming as their neighbourhood gathers together to help get their Christmas together before their daughter arrives home. I can’t help but feel giddy and excited about Christmas while watching this film. Everything is exaggerated from the decorations on the houses to the extremes the couple go to as they prepare for their cruise (think Tim Allen in his Speedos on a sunbed). If you’re into a bit of cringe and a good laugh, definitely give ‘Christmas with the Kranks’ a watch. Every year I can’t wait until the first of December so it’s accepta– who am I kidding? I’d watch ‘The Grinch’ every day of the year if I had time. For me it just epitomises joy, life, and family, and teaches the important message to be kind to one another – not to mention the existential implications of being just a small speck on one branch of a snowflake in a storm. It seems within the frameworks of a Christmas film that nothing is impossible. Not a baby who is raised by elves and seeks to reunite with his biological family; not the spirit of a dead father who returns to his son as a snowman; and certainly not the abandonment of a child whilst the rest of his family leave for a festive holiday in Paris. If there is anything that Christmas films have taught us, it’s that during this merry and joyous season, quite literally anything is possible. As suggested by the makers of ‘Home Alone’, nothing quite says Christmas like child desertion, or so it would seem. It is, however, the power of the festive spirit that enables such bizarre and unlikely stories to unfold, and the longing of family and joy that enable them to conclude in such jubilant endings. This is what is so captivating about ‘Home Alone’. Whilst at the beginning of the film each character demonstrates some form of resentment for one another, whether that be between siblings or parents and children (one could imagine that in a family of 20 there would be more disputes than that in current global affairs), by the end of the film everyone is blissfully reunited and happy to be in each other’s company. Here is what I find most warming about Home Alone: not only the struggle of Kevin left to fend for himself, but also of his mother who longs for her son, and his siblings who worry for their brother, and how what ultimately brings them together is their longing for each other. The simple yet stirring moral of this moving story is to never underestimate the power of family comfort. (And also, to never get half way across the world to realise you’ve left your child). After reading this you probably feel inspired to get cosy and put on one of these festive gems – if that’s the case then enjoy, relax and have a wonderful month of festivities.